As Prime Minister Modi is stated to arrive in America tomorrow, his second visit in his first administrative tenure as the head of Indian Government, the US is sending its Nimitz-class, 100,000-tonne carrier, the USS Theodore Roosevelt - which answers to the radio call sign "Rough Rider" - to the Bay of Bengal for joint war games with Japan and India during the latest edition of the Malabar series of exercises. However, the primary objective of Modi's visit to US is to woo American Multi-National companies to invest in "Make-in-India" projects as well as to entice the highly qualified Indian diaspora to get involved in Government of India's ambitious campaign - "Start Up India, Stand Up India". However, Modi's itinerary will also include an address to the United Nations sustainable development summit in New York and take part in a meeting hosted by President Barack Obama on peacekeeping. 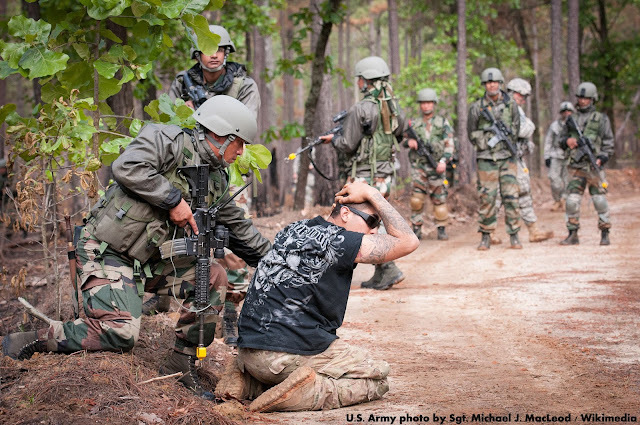 Currently, both the countries are indulged into The India-US Combined Military Training Exercise YUDH ABHYAS 2015, commenced on Sep 9, 2015 at Joint Base Lewis McChord, USA. This exercise was conducted to strengthen and broaden interoperability and cooperation between both the Armies and complement a number of other exchanges between the two forces. Over the years, the two countries have decided to progressively increase the scope and content of the combined training. Exercise YUDH ABHYAS 2015 witnessed a Formation Headquarter based Command Post Exercise, an Infantry subunit carrying out Field Training Exercise, Expert Academic Discussions on strategic issues of mutual concern by experts of both countries and Combined Training between detachments of Infantry of both armies. The exercise also provided an ideal platform for the personnel of the two countries to share their experiences on Military Operations in Urban Terrain, under the UN mandate. The USS Theodore Roosevelt heading a battle group in the Persian Gulf is destined to arrive in Bay of Bengal. Aircraft from its flight deck are launched to attack Islamic State targets. The carrier's deployment and the involvement of Japan immediately scale up the war games. But New Delhi is insistent that it is not entering into a military alliance against China.This is the first time that the Malabar series is going trilateral, involving the navies of the US, India and the Japanese Maritime Self-Defence Force (JMSDF) and sharpening focus on the possibility of deeper cooperation. The JMSDF participated in the Malabar drill in Indian waters once earlier: in 2007, when the navies of Singapore and Australia too were involved.That exercise, conducted on a NATO model, had riled China enough for Beijing to issue a demarche to New Delhi. Since then, the defense establishment under the ex-Prime Minister Dr. Manmohan Singh, steadfastly rejected multilateral exercises involving the US in Indian waters. The concept of DDTI was developed by Ashton Carter, who succeeded Chuck Hagel as US Defense Secretary on February 17, 2015, the DTTI offers India the possibility of co-producing and co-developing weapons systems with the Pentagon and US arms manufacturers. However, the very purpose to make India’s military increasingly dependent on the US in not the primary aim as stated by other foreign medias. A further aim of this policy is to provide a check-balance to the longstanding Indo-Russia military-strategic partnership. Just days before Obama’s India visit in January 2015, Russian Defense Minister Sergei Shoigu visited New Delhi to try to remove hurdles in actualizing an Indo-Russian agreement to develop a fifth-generation fighter jet, as well as a plan to build 400 advanced helicopters in India per year. According to latest inputs from various media sources, India is also eyeing US Carrier Launch Technology for Indigenous Aircraft Carrier-2, it plans to build to replace an aging British Aircraft Carrier INS Viraat in near future. One of the key carrier technologies India is interested in is General Atomics' Electromagnetic Aircraft Launch System (EMALS). EMALS works in tandem with catapult assisted takeoff but arrested recovery (CATOBAR) systems which are used aboard US Nimitz-class aircraft carriers, the most advanced carriers currently in the US fleet. This technology would allow Indian vessels to launch aircraft at a faster rate and with improved ease, compared to previous models. An EMALS and CATOBAR system would also allow Indian carriers to launch a range of heavy fighters and surveillance planes in quick succession. The core expectation out of this particular visit is to take forward the "2015 Framework for the US-India Defense Relationship" based upon the agreement between these two countries to intensify joint military exercises like YUDH ABHYAS and MALABAR naval war games. The Pentagon, it should be noted, already stages more joint exercises with India’s military than any other. The agreement also calls for increased collaboration in maritime security. With time, India has become increasingly concerned over Chinese expansionism, particularly in the Indian Ocean Region. Beijing has been steadily investing in port installations in Pakistan, Bangladesh, Sri Lanka, and Myanmar, countries in India's strategic backyard. These ports have allowed for Chinese merchant vessels, in addition to submarines and warships, to have safe harbor throughout the Indian Ocean. China recently raised Indian suspicions by docking submarines at the port of Colombo in nearby Sri Lanka and there is concern that Beijing is trying to construct a "string of pearls" through the Indian Ocean in order to establish naval and commercial superiority in the region. China and India also have a number of simmering territorial disputes along their extensive shared land border. New Delhi's growing wariness of China has opened multiple avenues for an expansion of defense relations with the US. Washington is currently involved in its "Pivot to Asia," an attempt to refocus military and political efforts towards China's areas of strategic interest. The US might see India as a local counterbalance to Chinese power, which may explain why the US is willing to share such advanced technologies. The Chinese establishment has warned New Delhi not to fall into a US "zero-sum trap." Pointing to the US’s anti-China "Pivot to Asia",the comment noted that the US has “ulterior motives” in depicting “the ‘Chinese dragon’ and the ‘Indian elephant’ as natural rivals". But we see this cooperation will be an everlasting one as long as both the nations understands the need of the hour and take the necessary actions to compliment each other's strategic objectives.